A Wealth of Experience benefits you! 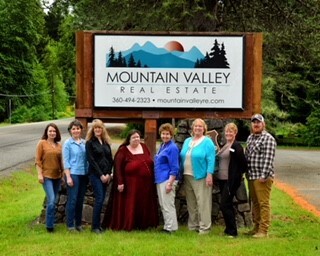 At Mountain Valley Real Estate, our agents serve clients in Real Estate Sales, Property Management, and Property Rentals. Our team of experienced Real Estate Brokers cares about the communities we live and work in. Our Designated Broker has 30 years of experience and our two Managing Brokers have 40 years of experience between them. Our team can help clients who are interested in buying property or selling property in these Lewis County communities: Adna, Centralia, Cinebar, Doty, Glenoma, Mineral, Morton, Mossyrock, Napavine, Onalaska, Packwood, Pe Ell, Randle, Salkum, Toledo, Vader, and Winlock.